72 Hours Film Challenge” Produced By H&M and UNFPA Lebanon (United Nations Populations Fund) in collaboration with VAPA— Canon DSLR Cameras were offered as Prizes for Winners! More on this project is found on http://www.72challenge.com. 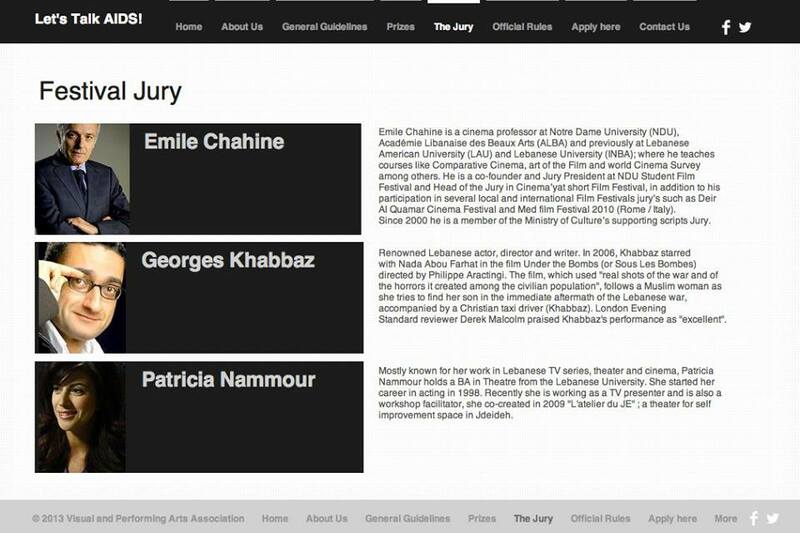 Thank You to All Jury Members! 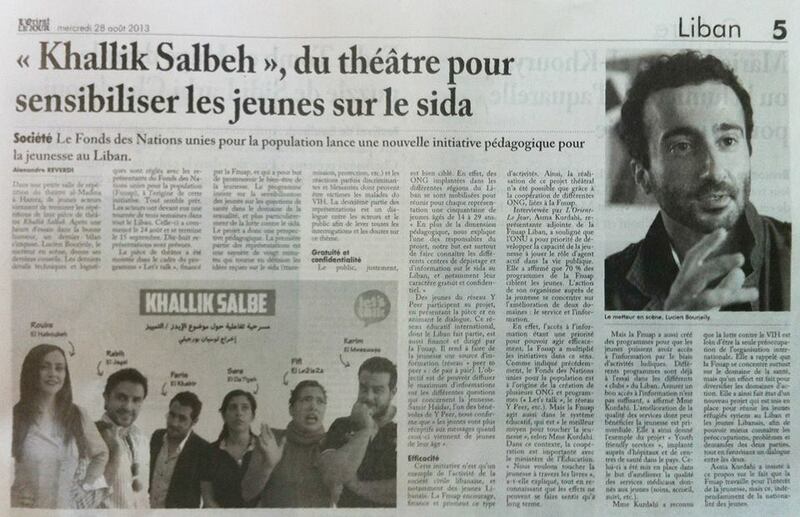 “KHALLIK SALBE” …. An interactive play about HIV/AIDS, Stigma & Discrimination. Workshop to devise the “Let’s Talk” campaign interactive PLAY that will tour Lebanon in summer 2013. Project supported/initiated by UNFPA Lebanon, Ypeer network, H&M. Implemented by the Visual and Performing Arts Association (VAPA). Performances dates will be announced SOON… Stay Tuned! 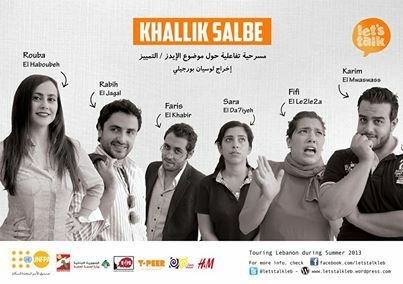 More info about “Let’s Talk” campaign visit: https://www.facebook.com/letstalklebPLAY – DIRECTOR Lucien Bourjeily. 29, Geday Residency, Mar Takla Church St. Near Dar Salam Bldg. Mar Takla Hazmieh. This workshop is designed for those who would like to add a creative spark, a burst of creativity to their writings, whether beginners, amateurs or professionals, this workshop will help you bring to the surface what’s been lying dormant inside. When it comes to writing, all of us are often blocked in expressing our thoughts in writing – usually because of learned, preconceived ideas of how we “SHOULD” write, when the truth is there are no rules or limitations to writing! In this workshop you will learn how to improve your writing skills through descriptive exercises, self-exploration, memory retrieval, lively class discussions and games! With a background in Advertising, Marketing, HR, Hospitality Management, Tourism (USJ/NDU Universities) and the Performing Arts, Charbel Naim is currently VAPA’s communication officer and a member of Improbeirut acting group. He is also a news editor/writer, actor and trainer. REGISTRATION FOR THIS CLASS IS A MUST. DEADLINE FOR REGISTRATION: June 30, 2013. The workshop is made of 4 sessions, 2 hours each (given every Tuesday and Thursday from 6:30 pm till 8:30 pm). The fee for this workshop is $120 per student. A certificate of achievement will be handed out at the end of the workshop. The advanced level of the creative writing workshop will offer you a compendium of writing exercises, daily practices, sources of inspiration, and even more quips and tips. With a background in Advertising, Marketing, HR, Hospitality Management, Tourism and the Performing Arts, Charbel Naim is currently VAPA’s communication officer and a member of Improbeirut acting group. He is also a news editor/writer, actor and trainer. REGISTRATION FOR THIS CLASS IS A MUST. DEADLINE FOR REGISTRATION: February 14, 2012. The workshop is made of 5 sessions, 2 hours and a half each. The fee for this workshop is $200 per student. A certificate of achievement will be handed out at the end of the workshop. “You tube” Creative Writing talk in “Helweh el Hayat” on LBCI, Monday January 7, 2012 at 3:30 pm. The workshop is made of 4 sessions, 2 hours each (given every Monday and Thursday from 6:30 pm till 8:30 pm). Starting from February 4 at 6:30pm until 8:30pm. The fee for this workshop is $120 per student. – LifeINSPIRED Vision Board for 2013 (Workshop) ; Who is this workshop for? Open to everybody who want to achieve their dreams, set goals and manifest them regardless of their current circumstances. – The “Creative Writing” Workshop is successfully taking place since 2 years. To join the next sessions please not that the nearest starting date is Monday November 3. It’ll be an intensive course (4 sessions; Mondays & Thursdays) from 6.30 until 8.30. If you wish to attend please register this Saturday November 1 (before noon) by passing by to fill the application form and settle the fee which is of 120 usd. You can join and register for future workshops at anytime. There will be 2 courses per week. -Photography Course for Advanced Participants. aLL details about the workshop will be sent to you by mail upon your request. Registration is a must. The next course will start as of mid December & will last until the end of December. TO REGISTER FOR ANY OF THOSE WORKSHOPS, SUGGEST A DIFFERENT COURSE YOU’D LIKE TO ATTEND OR GET INFORMED ABOUT THE FUTURE PROGRAM, PLS CONTACT US BY MOBILE OR MAIL. NEW ARTISTIC/CULTURAL WORKSHOPS WILL BE HELD STARTING JANUARY 2013.